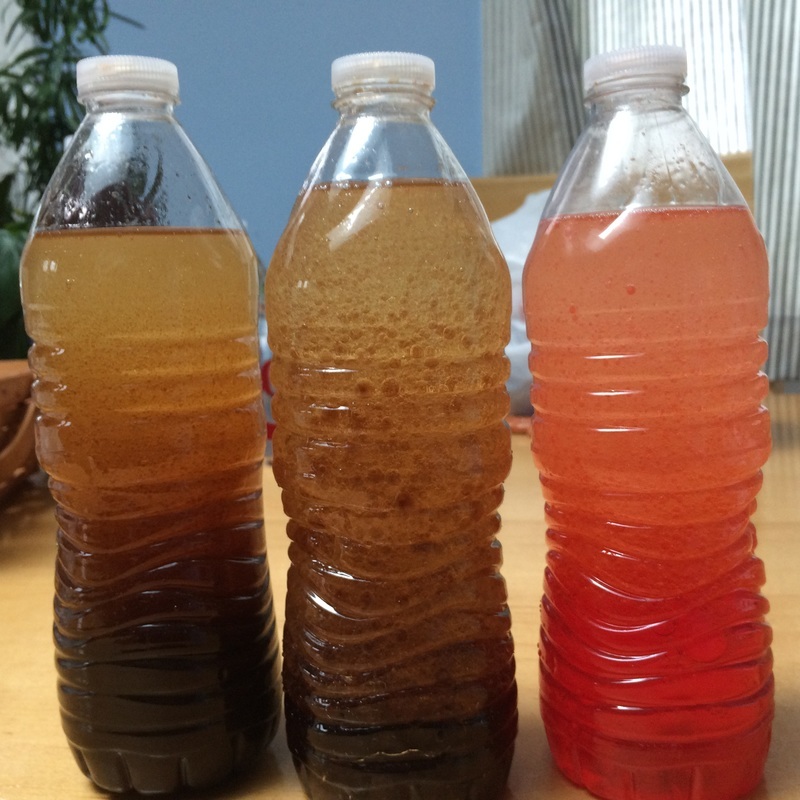 Out of water, Diet Coke and prune juice which liquid will produce the most entertaning lava lamp? 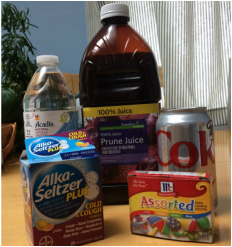 We think that Diet Coke will be the most entertaning because the carbonation of the Diet Coke combined with Alka-Seltzer will make bigger, better and best bubbles! Pour the liquids carefully so that you don't spill. Have an adult help with the Alka-Seltzer since it is a medication. Put the lids on very quickly after you add the Alka- Seltzer or the liquid may overflow. Using the funnel, put the water in one plastic bottle, the Diet Coke in another and prune juice in the third bottle. Filling them 1/3 (approximately 5 oz.) of the way each. Fill all three bottles the rest of the way full with vegetable oil leaving about 1 inch of air on the top. ONLY in the lava lamp that has water on the bottom put in a dozen drops of food coloring. It can be any color! Get out 1 Alka-Seltzer tablet for each of the 3 bottles. While you are waiting for the two liquids to separate, break each Alka-Seltzer tablet into little pieces. Working with one bottle at a time,drop in all the the pieces (from one tablet) of Alka-seltzer into a bottle. Put the lid on VERY quickly. Continue until all the bottles are done. Wait for some bubbles on the top, once there are bubbles turn it over or shake it. Your choice! ENJOY THE LAVA LAMP SHOW!!!!!!!!!!! There are no special needs for this experiment. If you look at the ingredients for Alka-Seltzer, you will see that it contains citric acid and sodium bicarbonate (baking soda). When you drop the tablet in liquid, the citric acid and the baking soda react, creating bubbles of carbon dioxide. The scientific formula is: H3C6H5O7 (citric acid) + 3 NaHCO3 (sodium bicarbonate) = CO2 (carbon dioxide) + H2O(water) + Na3C6H5O7 (trisodium citrate). The carbon dioxide creates big, fun bubbles. 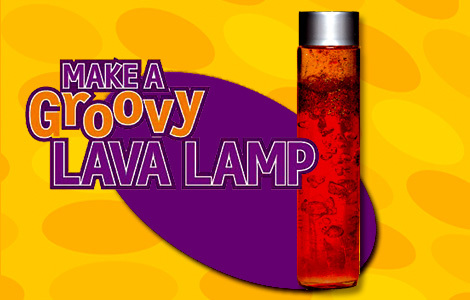 Those bubbles move the liquid (water with food coloring, prune juice or Diet Coke) up to create the lava lamp effect. In conclusion, we discovered that Diet Coke works the best because it has the most bubbles. When the Alka-seltzer is added, the carbon dioxide from the Alka-Seltzer combines with the carbon dioxide in the Diet Coke and more bubbles are created, making a great lava lamp! I am 10 years old and live with my sister, mom, dad, cat, 2 hermit crabs and my fish. I love to play my violin, read and do my Rubik's cube! Hi, my name is Sammie. I am 11 years old. In my family, I have my mom, my dad, me and 2 cats named Mooie and Tie. I also am a cat lover and I want to have 12 cats when I grow up. My favorite things to do are to go outside, have fun with family and friends, go shopping and ice skating. Hi, my name is Ava. In my family I have my mom, my dad, a cat and a dog. I like to dance, play tennis, ski and play with my pets! When I grow up I want to work in the medical field with newborns!